Samsung Refrigerator Now Dispenses Soda Water | OhGizmo! By David Ponce on 02/20/13 • Leave a comment! Stopping one small step short of dispensing Coke or Pepsi right from the door, Samsung has recently announced a partnership with Sodastream that will see a refrigerator doling out soda water from the same mechanism that dispenses still water or ice. You just press a button, select soda, and wait for your glass to fill with bubbly H2O. There’s space inside the door for a 60L CO2 cylinder, which can be easily changed when it’s running on empty. 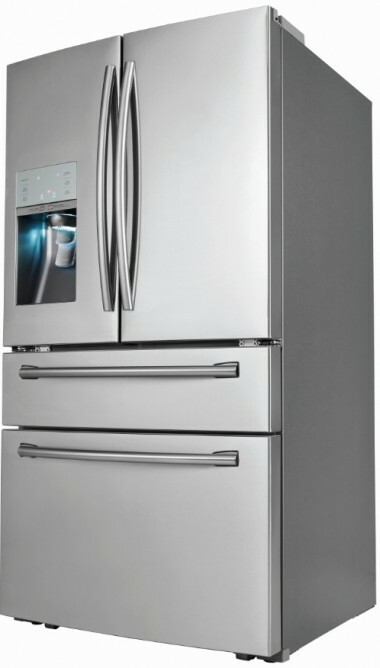 The rest of the four-door fridge is pretty top-of-the-line stuff from Samsung, featuring 30.5 cu. ft. of space along with a “kid-friendly counter-height FlexZone drawer with four temperature settings, and the proprietary Twin Cooling Plus® technology that keeps food fresher longer.” Of course a fancy fridge comes with a fancy price: consumers can expect to pay $3,899 in April, when this comes out.